North DeSoto RB Delmonte Hall is one of the most underrated running backs in the entire state. He does not get the recognition like other running backs such as Jenning’s Travis Etienne and Catholic High’s Clyde Edwards-Helaire, but he quietly goes along his business and is very productive. In a season that is very productive for running backs, Hall was one of the running backs that were at the very top. This season, the talented running back from North DeSoto had over 1,800 yards rushing and an incredible 38 touchdowns. A lot of high school football players don’t even have 38 touchdowns in their career much less one season. He is a touchdown machine and capable of scoring a touchdown on any given play. In a game earlier this season, he scored an unbelievable eight touchdowns in one game. When it comes down to the history of great North DeSoto football players, Delmonte Hall’s name will be one of the first to pop up. Throughout his career, he has had over 8,000 yards and 88 touchdowns. As impressive as he is on the field, he is just as impressive off the field as well. 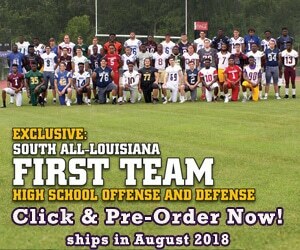 Louisiana Football Magazine Editor and T.V. Host Lee Brecheen has nothing but praise for the talented running back. Hall is a big time running back that is going to be a big time steal for a lucky college. That college is Southeastern Louisiana University after he decommitted from Northwestern State. He has committed to play for the Lions and Coach Ron Roberts has to be really thrilled to receive a gem in the talented running back from North DeSoto High School in Stonewall, Louisiana. Our own Alex Martin caught up with the star North DeSoto running back to talk about his great career, recruiting, Southeastern, his pregame routine, and so much more in today’s recruiting article! LAFM: What is your 40-yard time, max bench, max squat, and vertical? LAFM: What are your stats and accomplishments while at North DoSoto? I finished my career with 8,000 rushing yards and 88 touchdowns, I also scored 8 touchdowns in one game. I’m mentally tough and have great character. LAFM: What area to your game you are still trying to improve on? LAFM: What are your top schools as of now? LAFM: What is your favorite play to run as a running back? LAFM: What was the best game that you had while at North DoSoto and Why? In the Huntington game earlier this year, I scored 8 touchdowns. LAFM: Do you play any other sports besides football? LAFM: What are some things you look at when choosing a school to play for? Education system, graduation percentage, and draft percentage are the things that I look at when choosing a college. LAFM: Who are some artist that you like to listen to before a game? LAFM: What is your favorite go to meal before a game? My Mom and all my uncles played basketball and football. LAFM: Why would a college football coach want you on their football team? I have great character and a winning attitude. I know coaches love winning. LAFM: What do you plan to major in college? Education. I want to be a teacher. LAFM: Who is a college or NFL player that you model your game after and why that person? Lamar Jackson (Heisman Trophy QB for the Louisville Cardinal) because we both love winning and are elusive. LAFM: What advice you want to give to next year’s North DoSoto team? Never lose focus or fall apart, always stick together, and remember the ultimate goal, which is a state championship. LAFM: Who are some people you want to give a shout out to for putting you in the position that you are in today? I want to give a shout out to God first for blessing me with the ability and also my Mom, teammates, and coaches for making me a better man. Alex is from Cut Off, LA and is attending Louisiana State University and majoring in Sports administration with a minor in Business. He is also a graduate from South Lafourche High School. While at South Lafourche, Alex played baseball for the Tarpons earning All-District and All-Region honors. On weekends, Alex is a little league baseball coach and enjoys training youth baseball. At home, Alex enjoys time with family and friends.